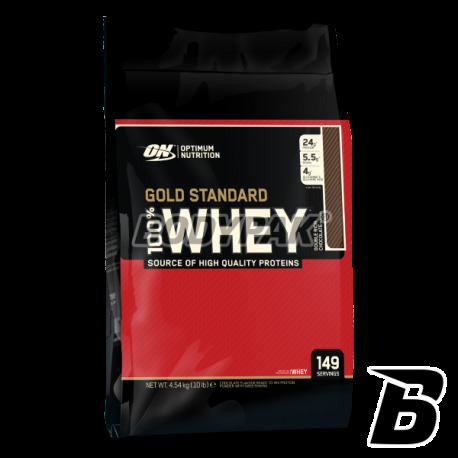 100% Whey Gold is one of the highest quality protein supplements, based entirely on the concentrate and whey protein isolate (also hydrolyzed). Sensational flavor and solubility is almost a legend! 378 loyalty points Your cart will total 378 points that can be converted into a voucher of 15,12 PLN. Optimum Nutrition 100% Whey Gold Standard - 1 sasz. 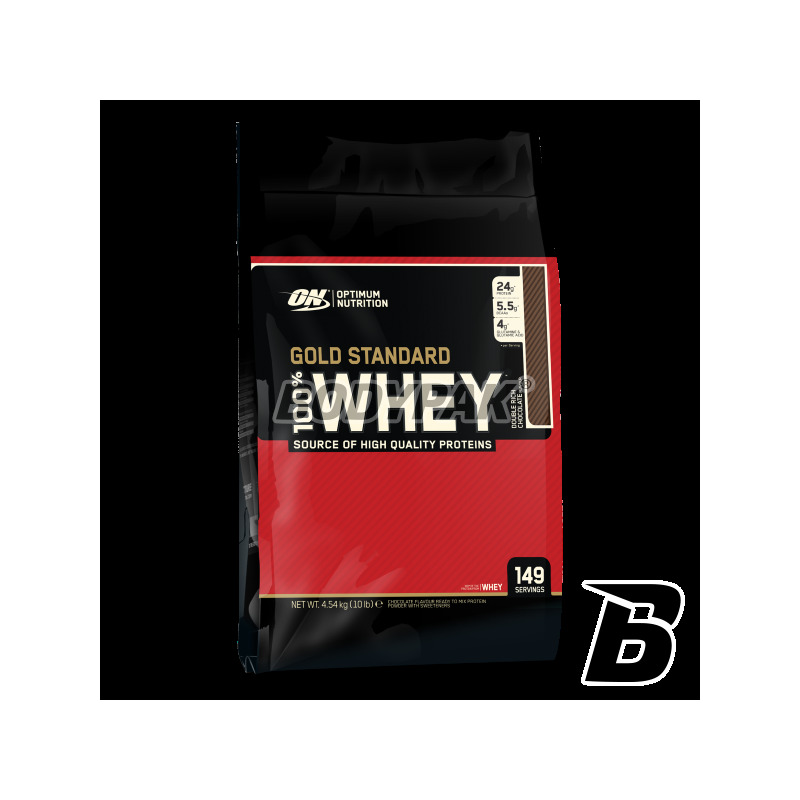 ON 100% Whey Gold belongs to a superior quality protein supplements, based entirely on the concentrate and whey protein isolate (also hydrolyzed whey protein isolate version). As a result, 100% Whey Gold Standard to provide to the athlete's body proteins and peptides peptides highest biological value, and the fastest time of absorption in the human digestive tract. Moreover, ON 100% Whey Gold contains a patented enzyme complex AMINOGEN, providing complete and rapid digestion of each portion of the product 100% Whey Gold. In addition, the product is equipped with the enzyme lactase, which helps in the digestion of lactose disaccharide contained in milk which ensures complete digestion of dissolved nutrients in milk, also by people who do not have lactose tolerance. Whey protein concentrate - very easily absorbed - absorbed from the gastrointestinal tract in only a few minutes, has a broad amino acid profile, high biological value BV = 104, rich in alpha-lactalbumin - reducing stress, prevent cancer and diseases, cardiac, lactoferrin that is perfectly absorbable iron and lactoperoxidase, conqueror of bacteria. Whey Protein Isolate - absorption time of a few minutes, the highest biological value BV = 159, ideal when you need to practice very fast delivery of amino acids for our body. The manner in which these isolates are obtained guarantee a minimum content of other macronutrients - fats and carbohydrates. Hydrolyzed whey protein isolate - protein subjected to preliminary digestion of the enzyme. As a result, they absorbed almost instantaneously, providing the body with the necessary building compounds (amino acids). The mixture of digestive enzymes - digestive supplement enzyów is to maximally speed up the process of digestion and assimilation of nutrients. Of course, the resultant body and the digestive system is almost fully balanced and not have to worry about stomach problems! ON 100% Whey Gold - invariably the best supplement on the market! Składniki (dla smaku lody waniliowe): mieszanka białek z mleka [izolat białka serwatki (emulgator: E322 - lecytyna sojowa), koncentrat białka serwatki, hydrolizat izolatu białka serwatki]; aromat; substancje słodzące (acesulfam potasu, sukraloza); kompleks enzymów (amylaza, proteaza, beta-D-galaktozydaza, lipaza, celulaza). Zawiera składniki mleka i soi (lecytyna sojowa). Może zawierać gluten, jaja, orzechy i orzeszki ziemne. Próbowałem 3 smaków - wszystkie bardzo dobre, najbardziej polecam czekoladowy. Topowy skład na rynku, minimalna ilość węgli i tłuszczy, które w odżywkach białkowych cechują się słabą jakością - jedna z najlepszych opcji na redukcję, lepszą opcją jest tylko czysty hydrolizat, który cenowo wychodzi znacznie drożej. Z czystym sercem polecam. Rewelacja! Smaki genialne, rozpuszczalność bardzo dobra. Ogólnie nie ma się do czego przyczepić. Amix Micellar Casein is a protein which is absorbed slowly and provides many hours of building material supply to the muscles. Protein supplement with the highest quality protein sources, which is up 5! High doses of BCAA supplement and effective form of glutamine per serving. Excellent taste and solubility! Anabolic Protein Monster Beef, is a product which comprises 90% of bovine serum albumin, which is currently the highest quality protein source in the market. Due to hydrolysis of protein digestion time it is much shorter. Superb protein supplement, one of the best on the market based solely on the hydrolyzate of bovine whey protein! Not without reason, the greatest bodybuilders put on beef!